You’ve probably heard the news that opera legend Luciano Pavarotti died Thursday morning at home in Italy. 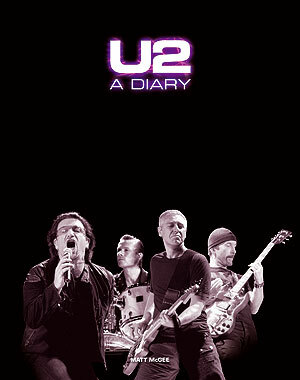 I thought I would share the U2 DIARY entries that mention Pavarotti; together, they paint a picture of the friendship U2, and particularly Bono, developed with the star tenor. Bono and Edge are joined by Brian Eno and opera singer Luciano Pavarotti at the latter’s “Pavarotti and Friends” concert in Modena, Italy, to perform the new song “Miss Sarajevo,” featuring vocals by Pavarotti. U2 later performs a version of “One” complete with classical orchestra. The concert is an annual event hosted by Pavarotti and is a benefit to raise money for the children of Bosnia. Bono appears with Luciano Pavarotti at the opening of a cultural center in Bosnia-Herzegovina. The U.N. confirms that Bono and Luciano Pavarotti will perform together at the Italian tenor’s annual charity concert near his hometown of Modena, Italy. This year’s concert, to be held May 27th, is slated to benefit Iraq war refugees. Bono and Pavarotti sang together in 1995 to aid children in Bosnia. Where is the justice in this world? The concert raises an estimated £1 million pounds for Iraqi war refugees. 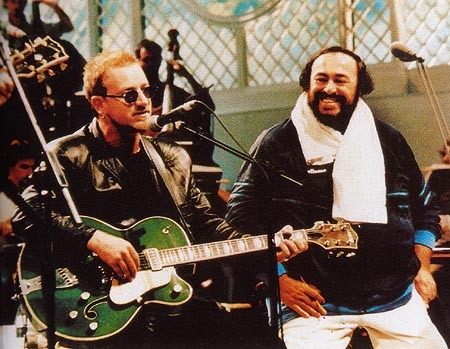 It’s Bono’s second performance at Pavarotti’s concert — he performed with Edge and Brian Eno during the 1995 concert. On the third of three nights in Amsterdam, U2 surprise the 50,000 on hand by performing “Miss Sarajevo” for the first time since 1997. Bono sings the operatic verses that were handled in the studio by Luciano Pavarotti. A day after visiting Sarajevo, Bono visits Luciano Pavarotti — who sang with U2 on the song “Miss Sarajevo” — at the tenor’s home in Italy. Pavarotti is recovering from surgery for pancreas cancer in July. Thanks for this, Matt; a very touching tribute of sorts to Pavarotti. Also in the last entry it should say pancreatic cancer not pancreas cancer. Thx, Dana. Good catches! This is all unedited/unproofed text for now. I’m most concerned about content than perfect wording at this point, but it will be gone over with a fine-tooted comb, both by me and the Editor at Omnibus. In the pavaroti article on http://www.u2log.com you can find a link to a YouTube movie of Bono and pavaroti doing a song called “Miserere”. It’s from the same show as the Ave Maria performance mentioned in this article. Why is this song not mentioned in the article? Could it be that they didn’t perform One but Miserere instead? Great find, OptimaX. Sure enough, Bono was part of 3 songs. I went back through the news reports from the concert, and even those only mentioned the two performances. So the book has been fixed. May I get your name and credit you for the help you provided? What a lovely and touching tribute to Mr. Pavarotti. 1. Do you know if his annual charity concert will be continued in his memory? If yes, who will organize it, etc.? 2. Do you know if a scholarship, etc. will be set up to honour him both for his humanitarian work and his musical legacy? I’m looking forward to contributing to your project and to reading your book. Best wishes to you. Thanks for checking in and posting a comment!